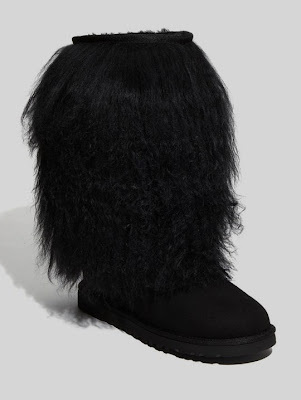 Savvy Mode: Savvy or Not so Much: Shaggy Fur Boots? 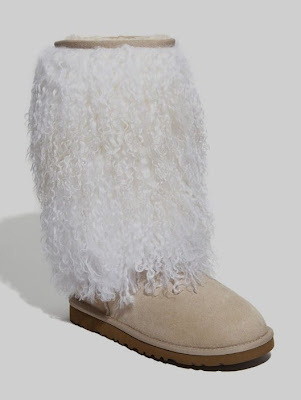 Savvy or Not so Much: Shaggy Fur Boots? In 2008, I tried on my first pair of shaggy fur boots at Fendi (see here). Since, there is a flurry of fur boots by various design houses. I thought those Fendi boots were ridiculous until I had them on. It was cute in an odd sort of way. One of my concerns was those fluffy fur would become dirty dragging on the floor. Well, 3 years later, UGG seems to address this issue. Wearing these furry boots can be quite tricky. If a gal is not careful, she will end up looking like a bear. If I am to purchase this pair, I probably buy it in black and wear it with skinny jeans or leggings. The look will be very casual and effortless. I am really on the fence because at $375 it is slightly pricey for a pair of fun boots to kick around. I can see Savvy Sis on the floor laughing, changing my name to Un-Savvy Gal..... What do you think, savvy or not so much?? Very flintstones hid but it would be warm! I'm going to have to say nay, but I agree that they would keep you very warm. Congrats, darling! You are the winner of my UPrinting business card giveaway! Just email me your full name and address to carriecalligraphy@gmail.com to claim your prize. Well, I have to be honest and say.... not so much. In my humble opinion, I mean (and I'm not a big fashionista, so don't listen to me)! But I love the knit Uggs, they're my favorite! See, I've never tried them. But I always feel that I will look like Sasquatch wearing them. HAHAHAHA But I think with the right figure and tapered leg pants one could pull them off. If you have too much hesitation, don't spend your money right away until your confident and sure. When you wear them, you must exude confidence! Hope you're having a great day. I definitely think you could get away with them. You're a stick and pretty, so they would look fab. On other people (aka me) the bear would probably come out. Lol. warm, wonderful and soooo stylish with skinny jeans and a crop sweater. I get rave reviews every time I wear them.